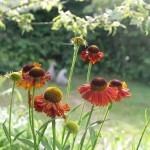 Summer is the time when the lovely and varied forms or shapes of the flower heads provide interest in their full bloom. Grouping similar flower shapes together and contrasting them with different forms is a significant part of good planting design for herbaceous planting. The many choices of flower shape include include daisies, spires, umbels, buttons and globes. To keep flowering as long as possible, ‘dead-head’ the fading flowers to give the chance for many new flowers to bud and bloom and as the summer recedes leave the seedheads to preserve the flower shape well into winter. 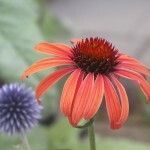 Orange Echinacea ‘Art’s Pride’ with blue Echinops ritro. Coneflowers – Echinacea have a daisy flower shape and are in flower from mid-summer through to October in a sheltered south facing spot. 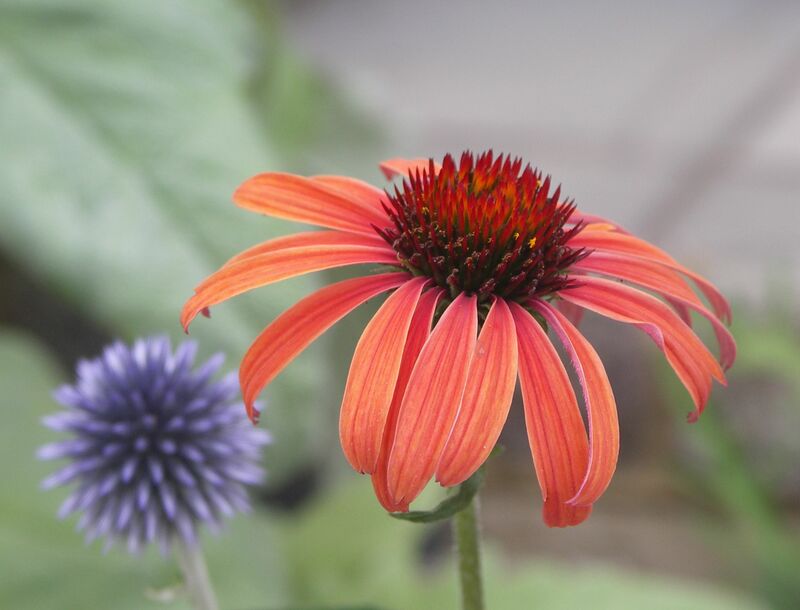 They have gorgeous cone shaped florets in the centre shown here in the orange ‘Arts Pride’. In the background, a round blue globe flower shape of Echinops ritro provides contrast of both colour and form. 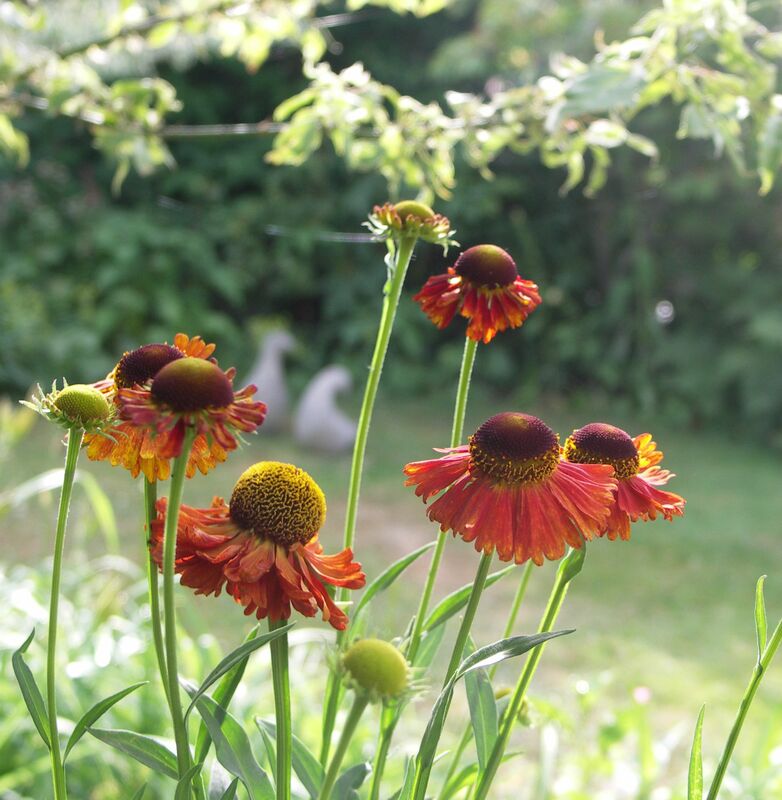 Heleniums – or ‘Helen’s flowers’ – are another daisy form with similarly interesting bulbous florets. This one is ‘Moerheim Beauty’. It grows tall – more than 1 metre and needs sun and water to keep it upright. 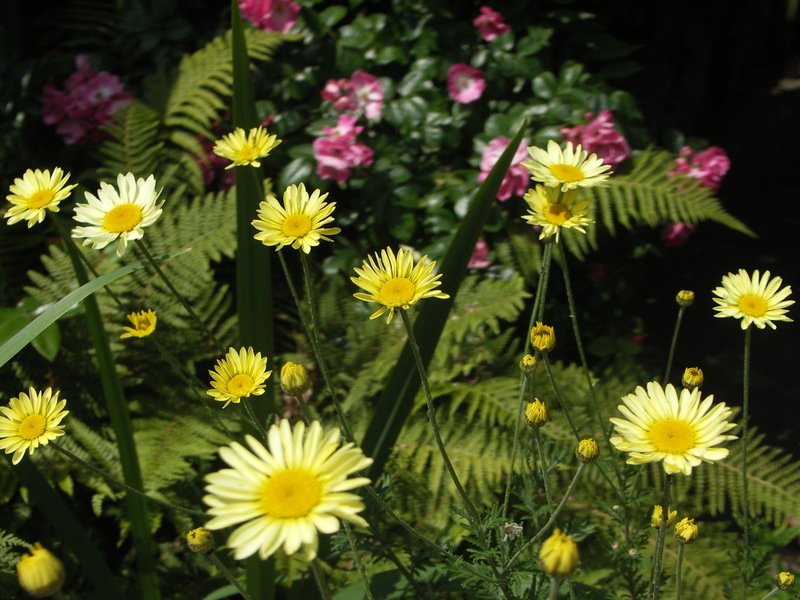 Camomiles – A great small daisy is Anthemis tinctoria E.C. Buxton. 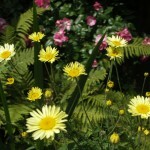 It grows to about 50 cm with loads of yellow flowers and sparkles in pots or borders. It too needs lots of sun. 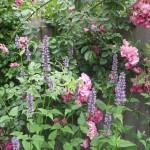 Cut the flowers for flower arrangements with salvias and other summer perennials. 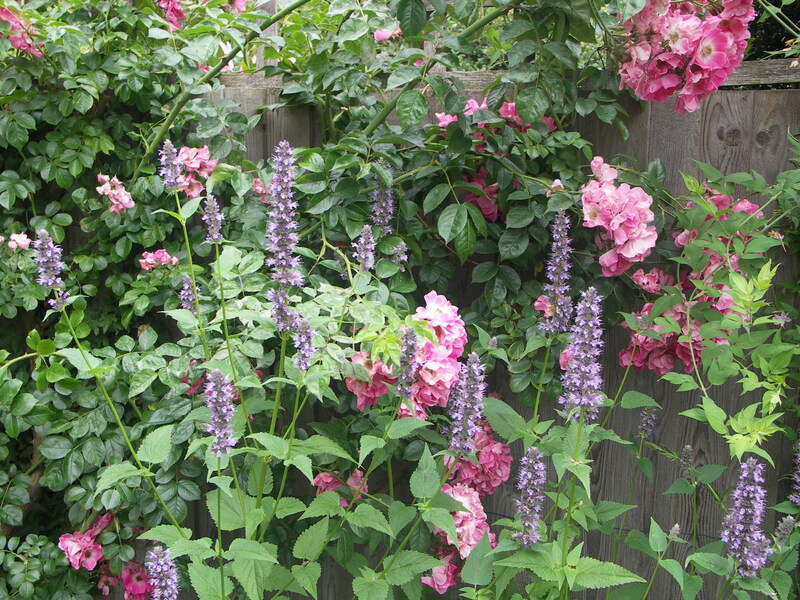 Agastache or Hyssop – ‘Agasta’ means ‘with great charm’ – and these smoky violet spire flower shapes of Agastache ‘Blackadder’ are particularly charming with the pink American Pillar rose behind it. 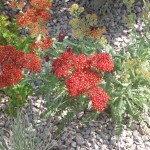 Achillea or Yarrow has lovely flat umbel or umbrella flower shaped heads in reds, oranges, yellows, pinks and whites. 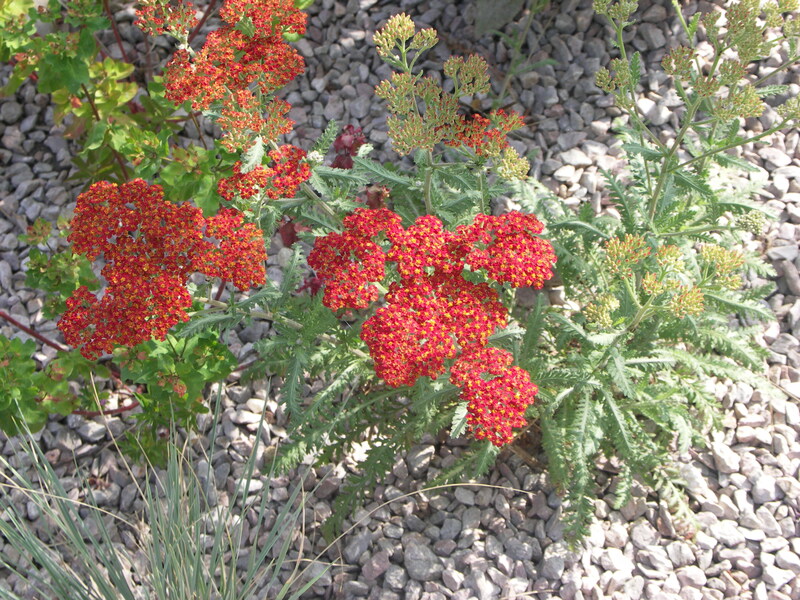 The plant is named after the greek warrior Achilles who stopped the flow of blood from his soldiers wounds with a concoction made from yarrow. This one is ‘Walther Funcke’ and is rather funky with its changing colours of terracotta to ochre. As well as the blue globe thistles, maroon Knautia macedonica, and the palest pink to rich maroon Astrantias have the small tightly packed clusters of flowers that make a button or globe flower shape. 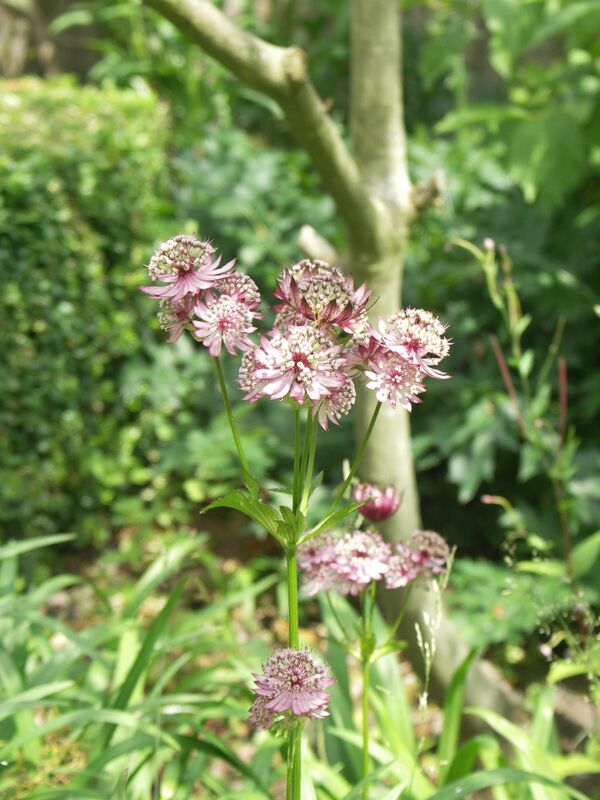 Astrantias need a cooler spot with partial shade and combine well with Alchemilla mollis or ‘Lady’s Mantle’. All these flowers are attractive to bees and butterflies and by choosing different flower shapes and hence different species, a wider range of butterflies will enjoy your garden too. 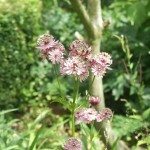 This entry was posted in Summer Flower Shapes and tagged Bees and Butterflies, Buttons, Daisies, Garden Design, Globes, Leaf & Acre, North London, Planting Design, Spires, Summer Flower Shapes, Umbels on July 21, 2013 by admin. Landscape design in North London covering locations in Finchley, Muswell Hill, Crouch End, Palmers Green, Winchmore Hill, Wood Green , Southgate, Highgate, Hampstead, Islington, Camden, Kentish Town, Mill Hill, Totteridge, Whetstone, Barnet and Enfield, London, Middlesex, Hertfordshire, Essex, Kent, Buckinghamshire, Surrey, and Berkshire.